North America Sheet IX Parts of Missouri, Illinois and Indiana. 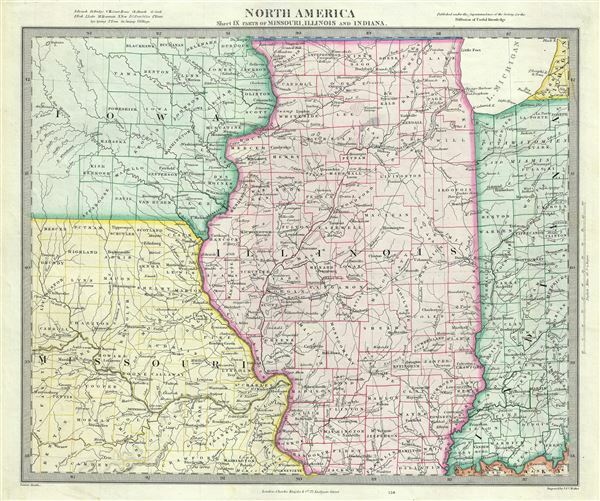 A lovely 1848 map of Illinois, Missouri, Iowa and Indiana by the S.D.U.K. The map covers parts of Illinois, Iowa, Missouri and Indiana from the Hahawa Lake in Iowa, south as far as Benton County in Missouri, east as far as Perry County and north as far as Lake Michigan and Lake County in Illinois. The map offers extraordinary detail with color coding to the state level. Created just two years after the Territory of Iowa was admitted to the Union as the State of Iowa, the northwestern region of the state, in this map, is not coded according to county. Notes towns, rivers, mountains, and other geographical features. Rumsey 0890.136 (1833 edition). Phillips (Atlases) 794.